Decor advice and interior decorating tips are easy to come by. I’ve seen many an interior decorating book proclaiming to show me "how the pros do it". Have you ever found all the professionals’ instruction to be overwhelming? I know I have. I’m usually looking for a few helpful tips to enhance the good features of my home, and I don’t want to have to go through mountains of study just to make that happen. Take a look around your home. Are you completely satisfied with every room in the house? Do you sometimes feel that your home could do with a complete makeover? Maybe you’re happy with the basics of your home’s decor, but some things need a bit of tweaking. Do you want to be able to jazz up the place yourself, or add some finishing touches? Do you need a little help getting started? Are you looking for a pointer here and there to enable you to perfect your space by yourself? If you're like me, you already know what you like - one of my favourite pastimes is paging through various magazines featuring decorated interiors - and then mentally redoing my home in the styles I find appealing. I feel that when you can already identify what pleases your eye then a professional qualification isn’t going to tell you more about yourself and what works for you. You just need to inject your personality into your design project and put your unique stamp on your space, so that it will reflect who you are and what you're about. Now I know that can be easier said than done. We each have our own barrier to customizing our homes. In some cases, it’s just that we’re not sure how to translate our ideas into something that fits our home. Maybe you’ve read an article in one of your interior design magazines on “best living rooms” and you absolutely love the living room layouts, but your living room doesn’t have any of the features that the magazine pictures show. I will give you suggestions of how to personalize that picture and interpret it in your own room. Of course there is also the matter of our budget. Interior decorating - especially what we love to see in magazines - doesn’t come cheap. My aim is to have something beneficial for everyone. If you need to take the long-term view with your interior decorating plans, there will be simple tips to make some immediate changes with home accessorising. Together we will start to look at our "canvases" in a new way. We’ll identify what we really like about the different styles we’ve been exposed to. We’ll look at our own rooms and see what features contribute to what we envision, and what needs to change. We’ll talk about shopping for our rooms (it’s not just about buying what you like, but buying what works). Best of all … we’ll allow ourselves to dream. That is what this site is all about, getting all those ideas that excite us out of our heads and into our homes - whether we are decorating bathrooms or decorating living rooms. But first there are some things we need to know about interior decorating. So let’s get started on this path, let’s learn interior decorating - we'll go step-by-step and create our own unique style. Keep up to date with new content added to interior-decorating-together.com with the Interior Decorating Blog. Romantic home decorating allows you to express your passionate side through your decor. I share how to create this intimate mood in the home. 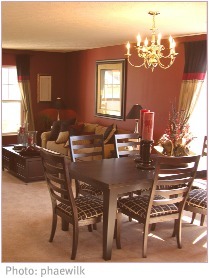 Home decorating help for you to create a haven for your vision or hearing impaired loved ones. Home decorating help for you to create a haven for your vision impaired loved ones. Decorating for kids can be challenging. These tips and ideas will allow you to have a safe and stylish home. Cater for your house pets with these decorating suggestions for a pet-friendly home. 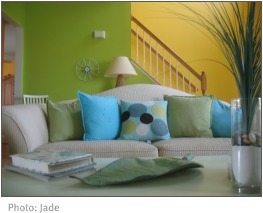 Interior decorating on a budget: some practical advice and how-to’s. Adapt the characteristics of tuscan decor for your home. Find out what inspired this decorating style, and personalise it for your own use. To get that ideal spacing of your furniture and decor accessories you need to understand how proportion and scale work together. What do your interior design pictures say about you and your home? Feeling down because your home can’t come close to those classy interior design photos? These tips are worth bearing in mind if you are using pictures for home decorating inspiration. This charming French country decor style will add something special to your home - the embodiment of the French countryside and family life. Moroccan decor is exotic and warm, with intricate designs and dazzling colours. Get that edgy urban feel with industrial decor. It is a simple-to-achieve modern look. Would you like to share your knowledge about interior decorating? Great, find out how you can submit your story or tip here.